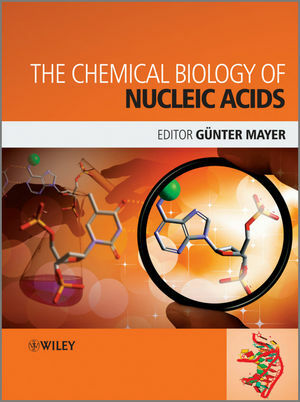 The Chemical Biology of Nucleic Acids is an essential compendium of the synthesis of nucleic acids and their biological applications for bioorganic chemists, chemical biologists, medicinal chemists, cell biologists, and molecular biologists. Professor Mayer's research involves molecular diversity applied to elucidate the conformation, function and identity of biomolecules. He is a co-founder of NascaCell Technologies AG, a leading service provider of innovative biomolecules, where he headed the combinatorial biotechnology department. He has published papers in leading journals such as Nature, Angewandte Chemie and Journal of the American Chemical Society. 1 Chemical Synthesis of Modified RNA (Claudia Höbartner and Falk Wachowius). 2 Expansion of the Genetic Alphabet in Nucleic Acids by Creating New Base Pairs (Ichiro Hirao and Michiko Kimoto). 3 Chemical Biology of DNA Replication: Probing DNA Polymerase Selectivity Mechanisms with Modified Nucleotides (Andreas Marx). 4 Nucleic Acid-templated Chemistry (Michael Oberhuber). 5 Chemical Biology of Peptide Nucleic Acids (PNAs) (Peter E. Nielsen). 6 The Interactions of Small Molecules with DNA and RNA (Yun Xie, Victor K. Tam and Yitzhak Tor). 7 The Architectural Motifs of Folded RNAs (Valérie Fritsch and Eric Westhof). 8 Genesis and Biological Applications of Locked Nucleic Acids (LNAs) (Harleen Kaur and Souvik Maiti). 9 Small Non-coding RNA in Bacteria (Sabine Brantl). 10 MicroRNA-guided Gene Silencing (Gunter Meister). 11 Nucleic Acid-based Therapies (Britta Hoehn and John J. Rossi). 12 Innate Immune Recognition of Nucleic Acids (Stefan Bauer). 13 Light-responsive Nucleic Acids for the Spatiotemporal Control of Biological Processes (Alexander Heckel and Günter Mayer). 14 DNA Methylation (Albert Jeltsch and Renata Z. Jurkowska). 15 Frameworks for Programming RNA Devices (Maung Nyan Win, Joe C. Liang and Christina D. Smolke). 16 RNA as a Catalyst: The Diels-Alderase Ribozyme (Andres Jaschke). 17 Evolving an Understanding of RNA Function by In Vitro Approaches (Qing Wang and Peter J. Unrau). 18 The Chemical Biology of Aptamers: Synthesis and Applications (Gunter Mayer and Bernhard Wulffen). 19 Nucleic Acids as Detection Tools (Jeffrey C.F. Lam, Sergio Aguirre and Yingfu Li). 20 Bacterial Riboswitch Discovery and Analysis (Tyler D. Ames and Ronald R. Breaker).